It's Back to School time and every parent needs fun ideas. Chances are your head is already spinning with class supply lists, room assignments, and schedules. You might feel as though you can't fit anymore information into your brain. Good news! This fun DIY tutorial won't use much brainpower and it will really take your child's back to school time to another level! When we are stressed out we tend not to eat as healthy because we are running on fumes. However, this lunch is a healthier alternative to many "prepackaged" choices out there, and is just as easy to get ready for the school day. For example, instead of fruit snacks on the carrot pencils, I used Smarty Pants Gummy Vitamins. My kids love the taste of these, they are all natural, and are packed full of awesome ingredients. 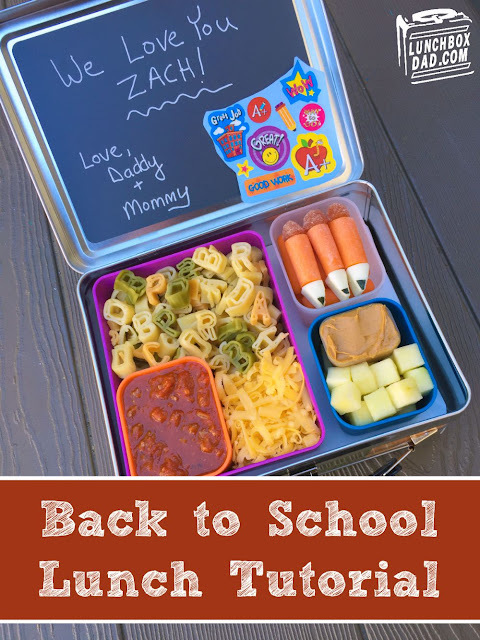 Not only does this post contain a recipe for putting together a fun school lunch, but I also want to share an easy idea to mod your kid's lunchbox so you can write notes to them directly on the lid! So make sure and scroll down all the way to the bottom or you will miss some of the ideas. Feel free to share this on social media as well so your friends can get in on the fun too! 1. Slice off each end of three baby carrots. Cut white cheese stick into pieces and then into cone shapes. Cut small triangles from dried seaweed snack (they probably won't even taste it on the cheese). Break toothpicks into pieces. 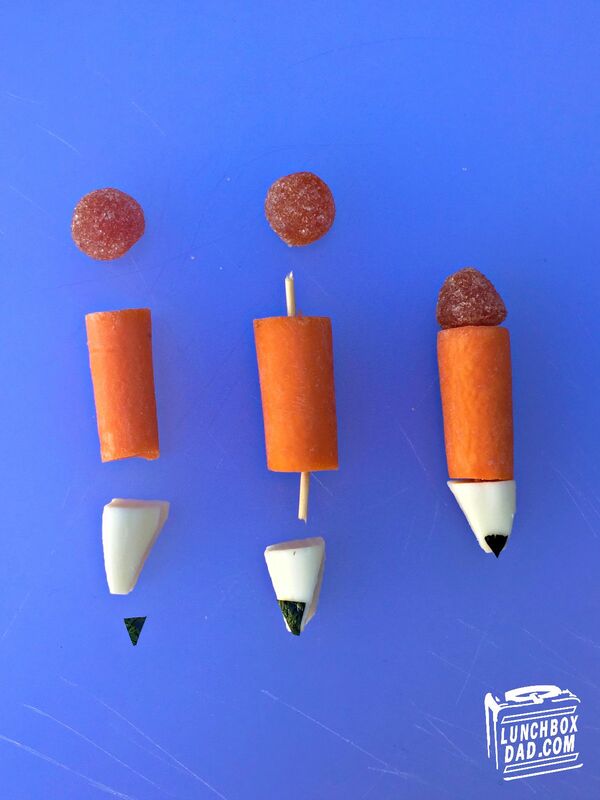 Assemble carrot pencils as shown in the picture above. If you are making the night before, don't put Smarty Pants "erasers" on until the next morning. 2. Place baby carrots and carrot pencils in side dish container. 3. Arrange pasta and sauce in main dish. If there is no way to heat up the pasta and sauce in the classroom, send it in an insulated container instead so it stays warm. Don't forget the shredded cheese! 4. Put nut-free spread into a very small dipping container. Place diced apples in another side dish. Rub apples with a lemon wedge so they don't turn brown. Kids love dipping things and apples are pretty much a required fruit for back to school, right? 5. Make sure and use containers that you can cover with a lid so food doesn't get all mixed up together. 1. Take your child's plastic or metal lunchbox and open it up. Paint the inside lid with chalkboard paint. Once dry, use a chalk marker to write notes to your kids. Chalk markers erase just like chalk but there is none of the messy dust to get in the food. You can easily find chalkboard paint and chalk markers at your local craft store or online. 2. Periodically, include a few stickers in the lunch. Just use a small amount of scotch tape to attach them to the inside lid. Make sure and include enough stickers for your child to share with their friends! I worry that my ten year old son would forget there is a toothpick in the carrot.